Scouts and leaders in reciting the Scout Oath and Law. 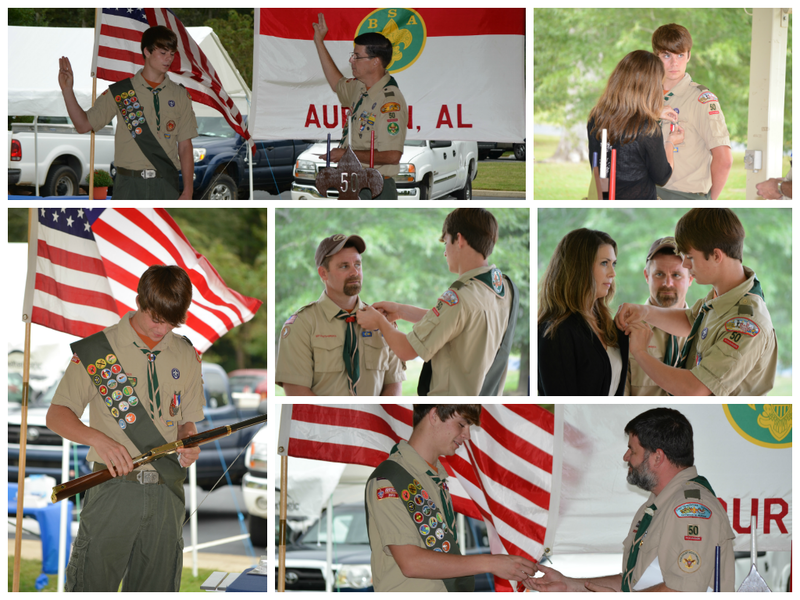 Troop 50 convened its second Eagle Scout Court of Honor of 2014 — this one on the afternoon of Sunday, Sept. 28 at Town Creek Park in Auburn. The honoree of this court of honor was Ethan Smith, a founding member of Troop 50 and the son on Assistant Scoutmaster Jason Smith and his wife Anita. Family, fellow Scouts, friends and Scout leaders filled the park's pavilion to honor Ethan and congratulate him on his efforts to achieve Scouting's highest rank. Ethan is among the troop's five Eagle Scouts to date since the troop's founding in November 2012. ASPL Davis to open the Eagle Scout ceremony. Senior Patrol Leader Will, with the help of Jack, Liam, and Kyle, opened the ceremony with a patriotic reading, after which the audience joined in the recitation of the Pledge of Allegiance, and Scouts in the recitation of the Scout Oath and Scout Law. Davis led the gathering in an opening prayer and turned the program over to Scoutmaster Andrew Baird. Mr. Baird recounted his personal relationship with Ethan, starting with Ethan's crossing over from Webelos to Boy Scouts and, more recently, serving as his Eagle project coach for his project building a bridge at Ogletree Elementary School's outdoor classroom. He complimented Ethan's maturity and the leadership he has provided in Scouting along his journey to Eagle, including his service to Troop 50, which began as its founding assistant senior patrol leader and through a variety of leadership positions since then. This story will never end. Like the "Golden Pebble" of service dropped into the human sea, it will continue to radiate in ever-widening circles, influencing the characters of men through unending time. After joining Mr. Baird in front of the audience, Ethan accepted the "Eagle Charge" from Troop Committee Chair Rob Stanford and recited the "Eagle Scout Promise" administered by Mr. Baird (above photo, top left). His mother, Anita, then presented him with his Eagle Scout medal (above photo, top right); his dad, Jason, presented him with his Eagle Scout neckerchief slide; and Mr. Baird, his Eagle Scout patch, certificate, and recognition card. In return, Ethan presented Eagle Scout parents pins to his mother and father (above photo, middle photos). Assistant Scoutmaster and Troop Advancement Chair JP Pendleton presented to Ethan on behalf of the troop a membership certificate in the National Eagle Scout Association (NESA) and a "promotion" to the position of junior assistant scoutmaster in the troop (above photo, bottom right). Finally, to commemorate Ethan's achievement, Ethan's parents presented him with a keepsake rifle bearing his name and the date he passed his Eagle Scout board of review (above photo, bottom left). Ethan than shared some words of thanks to those who attended the ceremony and inspired him along his way to earning the Eagle Scout rank. As tokens of his appreciation to his Scouting mentors, he presented Eagle Scout mentor pins to his father and to Mr. Baird. Charter Organization Representative Michael Tullier offered a closing prayer using as an analogy to Scouts' determination to earn the Eagle Scout rank a biblical passage from Isaiah 40:30-31. Following the ceremony, family, friends, Scouts and leaders joined in a reception and the opportunity to congratulate Ethan personally on his achievement. The videotaped ceremony is available below, and additional photos are available in the troop's online photo album.